Temple Audio LTD. Home of the Bantam. At Temple Audio we manufacture a range of small, ultra-modern amplifiers to suit all tastes and budgets. Ranging from our basic, low-cost, Class T amp, all the way to our Temple Audio class D Monoblocks -- the ultimate in small digital technology. Our flagship product is the Bantam Gold. A miniature stereo digital amplifier with ten times better sound quality than Class T, it offers performance normally available only from amplifiers costing thousands of pounds. If you want to be kept up to date of the latest goings on at Temple Audio, join our mailing list. Please observe the deadlines below for ordering one of our products in time for Christmas. Orders placed after these dates will still be processed and sent out as usual. But you may not be guaranteed to get the item before Christmas. Thanks to everyone for another wonderful year manufacturing amplifiers right here in the UK. We are pleased to announce the release of a new product that we have designed to partner with our digital amplifiers. The Supercharger Power supply is a linear regulated, super capacitor buffered power supply. Which is derived from the same technology we developed for our high end Bantam One Amplifier. Take a look at the new product page for the SuperCharger here. Some people have been asking us if our products will be affected by the Tariffs that have been introduced recently by various countries. As we make all our products from scratch right here in the UK, I am happy to let you know we wont be affected by import Tariffs in any significant way. So our prices have not changed. Take a look at our NEW 2017 Monoblocks. Upgrading our class leading digital monoblocks with better sound quality AND more power. New Product Release. The Bantam One. We are pleased to anounce a new amplifier at Temple Audio. The Bantam One. Which is a product we know some people have been waiting a very long time for. The Bantam One is a fully featured integrated amplifier that is slightly larger than our usual products. We have been putting together a dedicated website for the Bantam One which will go live over the weekend. We are pleased to announce a new product in our store, a 3 input phono pre amplifier called the Harmony Phono Stage. The Harmony is a product we have been custom making for customers who wanted extra inputs on their Bantam Gold. Adding 2 line level inputs and one high quality record deck input to any system it is used with. We are pleased to finally make enough stock of them to list them in our store. Head over to the Harmony page to read more about it. We are pleased to announce that the Temple Audio Monoblocks have been professionally reviewed for the first time on www.enjoythemusic.com. It's a very informative and comprehensive review that's based on over a year of research and experimentation by a highly experinced reviewer for the mainstream Hi-Fi press. So we recommend that you read it, even if you already own them -- you can always learn something new. You can find the article at here. Also, in response to a prolonged spam attack on our customer support system, we have updated our contact page to include a Captcha code. This ensures that only real human beings can send us messages. Our priority with templeaudio.net is to make this site as simple and straightfoward to use as possible. Ultimately, it came down to the fact that we were missing some customers' questions due to high volumes of spam. We are always fascinated to hear the unique and creative ways customers are using the Bantam Gold. So we were especially pleased to recieve this video from Dyson LTD, an extra-special customer, who has been using Bantam Golds in their labs for many years now. Yes, that is the same Dyson that is famous for making the world's best vacuum cleaners, although they actually do a lot more than that. For my fellow technology geeks, the video is very interesting in itself. You can see a Bantam Gold about 30 seconds in. Dyson are a great British technology company which strives for cutting edge performance through research and smart design, so we are incredibly proud to play a tiny part in what they are doing. As a very low distortion amplifier The Bantam Gold will excel in a laboratory environment. Unlike a lot of Hi-fi, it doesn't colour the sound in any way. Whatever signal you put in to it, that's exactly what you get out of the speakers, 'warts and all'. People often ask us about our 'custom capabilities', so I thought I'd post some pictures for you all of one of our recent custom projects. A customer wanted Eichmann cable pods and RCA connectors on his Monoblocks. But this wasn't a simple drop-in replacement, it required a new back-panel design and precision machining. Since we do all machining in-house at Temple Audio, it's not difficult for us to produce custom designs using our high-precision CNC machine tools. With results like this. Yes, you read it right this is our first professional review. I've been a long term reader of TNT audio, and a supporter of their campaign for real stereo. So I couldnt be happier to know that TNT Audio have published the first (and currently, only) professional review of the Bantam Gold. 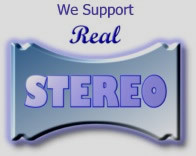 After reading the wonderful page on TNT audio, we have decided to show our support for real stereo. Those of us who have experienced well recorded music through a good quality stereo system know all about the spatial (3D) information that comes through stereo music. (check our feedback page for examples). Many of us have noticed how music recording standards have dropped in recent years as people forget the true value of proper stereo recording. We must show our support for real stereo and educate others, so the record industry will continue to produce the true stereo recordings we enjoy so much. Take a look at the Real Stereo Page at TNT Audio.